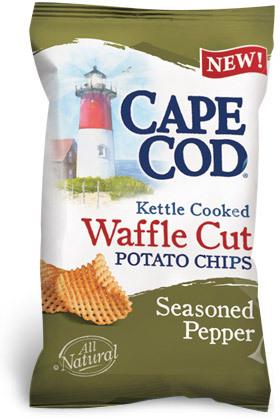 The great Cape Cod designs continue with Seasoned Pepper. The 'Waffle Cut' pops against the khaki greenish colored backdrop. The Chips (presumably Photo-shopped to make sure the little holes are present in all the cavities), look tasty and inviting, and it all looks great. Except for, yes, we did say 'khaki'. We guess Cape Cod ran out of colors! More like biting into a cookie than a Chip. So it's a little unfair to have a Crunch Test for this particular Chip style. It has a nice, thick feel and a firm crunch, but not in the same way as a standard Chip. Okay, we made it through the Sea Salt review without admitting it entirely, but the Waffle Cut appears to be a bit of a gimmick. More like a child's shaped Chip than a good old fashioned Kettle Cooked Potato Chip. However, these were solid (apart from the holes), thick and seasoned with an orangish glow. They were also good for dipping. What on earth can 'Seasoned' Pepper mean? Pepper is a seasoning! Well, this was our first thought. But after chomping a bagful, we cans say that the peppery flavor was clearly a combo of peppers and not just cracked black pepper which is most familiar with this single type of seasoning flavor. It says it's All Natural on the packet, but there's all sorts of stuff in them, including paprika and red chilli peppers. They got hotter the more you ate, which was great.